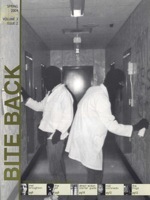 “Issues 6-10 of Bite Back magazine were published between July 2004 and February 2006. 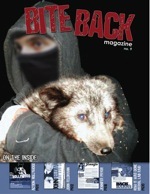 It was a busy couple of years, for the animal rights movement and for the magazine. 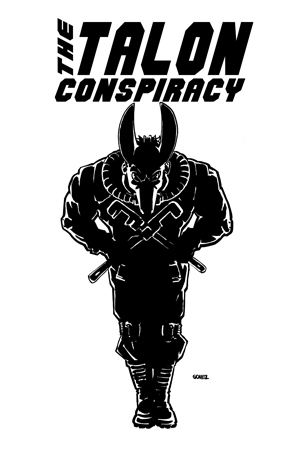 Issue #8 was the first of Bite Back’s expanded format. The magazine jumped from 16 to 36 pages, and added full-color covers. Also beginning with #8, the magazine was no longer mailed out free-of-charge. The growth of the mailing list forced Bite Back to begin charging for the magazine. 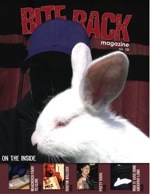 In issue #7, Bite Back marked the return of the lab raid to the USA, when 401 animals were liberated from the University of Iowa. #8 features a “How It Was Done” story of the rescue of a dog from a laboratory in Tokyo, the first and so-far only such action in Japan. Issue #10 celebrated the closure of the infamous Newchurch guinea pig farm. There’s other good stuff in these issues: interviews with Keith Mann and Mel Broughton, Bite Back’s “Top Ten List” of ALF arsons (issue #7), and popular features such as “When Animals Bite Back,” which was a collection of news reports of hunting accidents, bulls goring matadors, farmers eaten by pigs, etc. — examples of “violence” that all activists could get on board with!